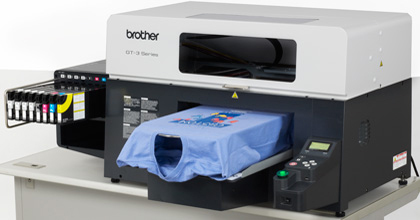 This beginner’s garment printer offers only black, cyan, magenta, and yellow Brother ink, meaning you will only be able to print on light or white materials. The 1200 dpi quality will produce photo-quality images that can be loaded directly through the USB flash drive port. An ethernet interface is also available so multiple users can share the GT-341 in an office or shop. GraffixPro Studio t-shirt design software is provided by Brother, making this is a perfect machine for a startup company. The mid level model has all of the same built-in features as its younger brother (pun intended), but it offers two additional white printheads, allowing you to print on lights and darks. The ink cartridges are front loaded and there is room for two additional white printheads, which would upgrade it to the high level category. As the middle model, the GT-361 is ideal for an established garment printing company with a steady, but not heavy, volume of orders. 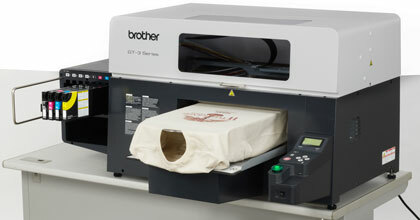 The GT-381 offers all of the features that the other two Brother garment printers do, and then some. This model is the cream of the crop, featuring cyan, black, magenta, yellow, and four white ink cartridges. Besides having 8 printheads, what sets this printer apart from the others is its production speed. The white and the color ink is distributed simultaneously to create a single-pass printing method, which minimizes the time it takes to complete each task, making it the best option for high-volume companies. 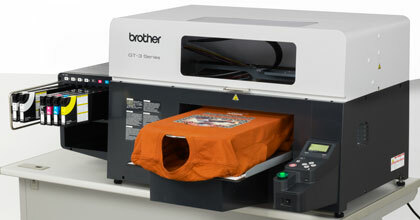 Though clearly built to appeal to shops with varying volumes, these three Brother GraffiTee digital garment printers will all generate top-of-the-line quality. The unique modular design of the GT-341 and GT-361 enable them to grow with a young company, and the GT-381 is fully loaded to handle rapid fire demands. These machines are not exactly inexpensive, but the overall value will certainly pay off.